Ab39194 recognizes the zymogen of ADAMTS1, and the furin cleaved ADAMTS1, but not the shed form. Synthetic peptide corresponding to Human ADAMTS1 (C terminal). This antibody recognizes the last 28 amino acids of the protein. Our Abpromise guarantee covers the use of ab39194 in the following tested applications. Cleaves aggrecan, a cartilage proteoglycan, and may be involved in its turnover (By similarity). Has angiogenic inhibitor activity. Active metalloprotease, which may be associated with various inflammatory processes as well as development of cancer cachexia. May play a critical role in follicular rupture. The spacer domain and the TSP type-1 domains are important for a tight interaction with the extracellular matrix. The precursor is cleaved by a furin endopeptidase. ICC/IF image of ab39194 stained Hek293 cells. The cells were 4% formaldehyde fixed (10 min) and then incubated in 1%BSA / 10% normal goat serum / 0.3M glycine in 0.1% PBS-Tween for 1h to permeabilise the cells and block non-specific protein-protein interactions. The cells were then incubated with the antibody (ab39194, 1µg/ml) overnight at +4°C. The secondary antibody (green) was Alexa Fluor® 488 goat anti-rabbit IgG (H+L) used at a 1/1000 dilution for 1h. Alexa Fluor® 594 WGA was used to label plasma membranes (red) at a 1/200 dilution for 1h. DAPI was used to stain the cell nuclei (blue) at a concentration of 1.43µM. 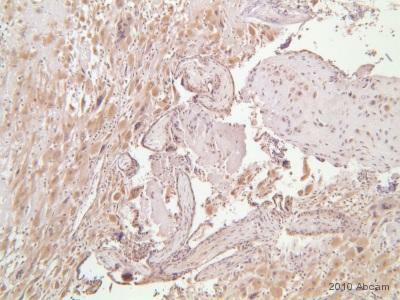 ab39194 staining ADAMTS1 in Human Placenta (Decidua) tissue sections by IHC-P (Paraformaldehyde-fixed, paraffin-embedded sections). Tissue was fixed with formaldehyde and blocked with a peroxidase block for 5 minutes at room temperature. Antigen retrieval was by heat mediation in sodium citrate. Samples were incubated with primary antibody (1/50) in antibody diluent for 1 hour. An undiluted HRP-conjugated Goat polyclonal to rabbit IgG was used as secondary antibody. Publishing research using ab39194? Please let us know so that we can cite the reference in this datasheet.